The WordPress Twenty Fifteen theme offers a clean design style that’s highly customizable for the millions of WordPress users who want a simple but modern look that focuses on the content for their sites. As such, the font is sharp and easy to read. Many of the new built-in theme features allow you to make simple yet elegant tweaks to the theme, including uploading new feature images and adjusting the background colors. You can plan a web design project that includes choosing how many columns you want to use for your design layout. 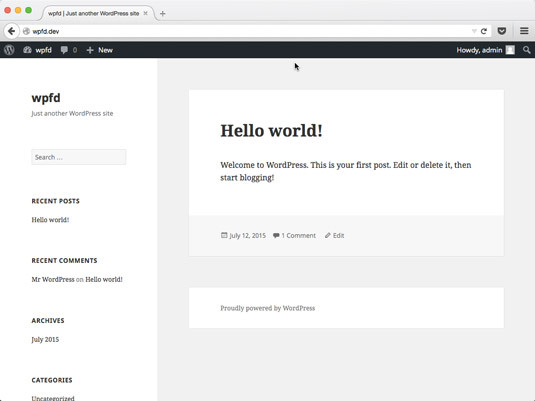 The default Twenty Fifteen theme has only one layout option for you to use, as it is meant as a starter theme to get up and going with WordPress quickly. The layout for the Twenty Fifteen theme is a two-column layout with the sidebar on the left side and the primary content on the right side. This is a popular layout trend for blogs in particular, as it is easy to include vital navigation links and include widgets in the left sidebar, leaving the right side with a larger space to view the website content (that is, page and post content). To change the content in the default left sidebar in the Twenty Fifteen theme, simply add a widget or two (or more!) to the widget area on the Widgets page on your Dashboard. The Twenty Fifteen theme has only one widget area. The widgets you add to the widget area appear in the left sidebar of your website.